Manufactured by Stainless steel . Can assembly fix focus and zoom camera. Have sun shield and rain scraper or hidden rain scraper . 3 cable outlets at back of the camera. Install outdoor, all weather use. Could assembly decoder panel . 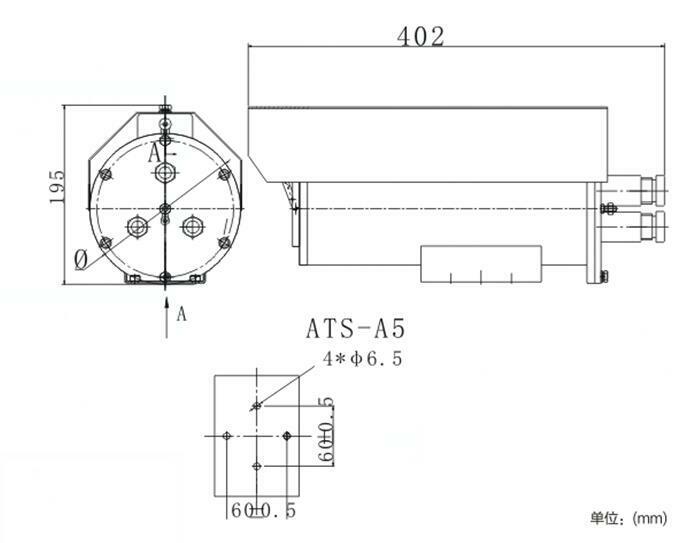 YTS-A5 all weather ex-proof camera design and build according to GB3836-2000 standard,usig scienticfic ex-proof structure meet the ex-proof requirement .Buid in fix focus camera or intergrated zoom camear,also equipped with sun shield ,rain scraper. Can be used in the erosive ,explosive gas area .Do not affect by evaporate ,rain drops and vibration afttect ,but need to avoid salt environment .Optional rain scraper ,sun shield and housing heating device . Window use tempered flat glass ,to make sure its durable but also keep the picture clear. Sunshiled can lower the inner equipment tempreture.Scraper keep the windoe clean ,the heating system can keep the equipent working at low tempreture. ; Could assembly decoder panel .